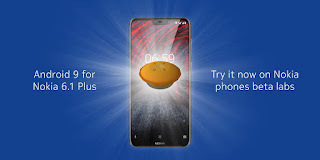 The Nokia 6.1 Plus might be the next Nokia smartphone in line to receive the Android 9 Pie update after the Nokia 7. HMD Global's chief product officer took to his twitter page to announce that the public beta Android 9 Pie program for the Nokia 6.1 Plus has just kicked off. This is a beta ROM and not the stable ROM so to get the update, you need to manually download it from the Nokia Beta Labs. If you are installing the beta ROM then you need to note that there are chances you will experience a couple of bugs since this isn't the stable version yet. There is no word from HMD yet on how long the beta program will last before the stable version starts rolling out but we expect the stable android Pie to start rolling out for Nokia 6.1 Plus users later this year or early next year.